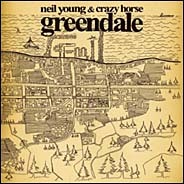 Neil Young's Greendale debuted in Europe during an acoustic solo concert tour that began in April 2003, and then continued to the US with an electrified Crazy Horse and full staging using sets and actors. There has been controversy on the Greendale tour with many in the audience bewildered by 90 minutes of new songs before an encore of classics. Neil's official website Shakey's Garage has provided tantalizing glimpses of the upcoming CD and DVD. The site features an intricate family tree of the Green extended family, art from Lenore's Gallery, maps of the Greendale town, and other clues to unraveling the mysteries of Greendale. "For me, it's about the chance to be new, rather than a big celebration of me, which we had to avoid at all costs," he says of his decision to play nearly two hours of new material before his audience gets its nostalgic itch scratched for oldies such as "Old Man" and "After the Goldrush." "I don't believe in just doing my hits, because you can only do that so many times, and then you just repeat yourself. At this stage in my career, that would be the kiss of death. You might as well go to Vegas and just collect. I don't want to do that yet, and hopefully I can avoid doing that for a long time. "There's a charge in doing all these new songs at once, all in a row. It's a big rebirth for me. I was apprehensive introducing this much new material at once, but it's something I looked forward to, because it's a challenge. A challenge for me, and a challenge for the audience: It's really one long song, and to get your money's worth, you have to pay attention." The seminal Greendale CD was released on August 18, 2003 to mixed reviews. The New York Times hailed the Greendale album for it's "beauty, hope, pathos and power" while The Washington Post bashed it as "A vanity project gone stupefyingly wrong". Again, Neil defies both critics and fans for his steadfast refusal to be anything other than himself. Photo by Doug Stacey, Milwaukee, WI 6/19/03. "there's corruption on the highest floor"
suits poured out of elevators "they're all dirty"
phoneheads began to speak "you can't trust anybody"
and said,"truth is all i seek"
sayin', 'the solution is to vote him out'"
to paralyze our state with fear"
Greendale's "Sun Green" is to the ' 00's what "Ohio" was to the '70's. Not since the first Persian Gulf War in 1991 during the Arc/Weld tour when Young performed Bob Dylan's "Blowin in The Wind" has Young placed so much energy and passion into his singing and songwriting. Greendale's blues sound reflects the influence of bluesman Jimmy Reed and his driving electric blues and folk meoldies. A 10-song concept album, Greendale is set in a fictional California seaside town. Based on the saga of the Green family, the "audio novel" has been compared to the literary classics of John Steinbeck's work, Thornton Wilder's "Our Town" and Sherwood Anderson's "Winesburg, Ohio" for its complexity and emotional depth in exploring tragedy in a small town in America. Greendale combines numerous themes on corruption, environmentalism and mass media consolidation into relevant post-9/11 art. Amplifying themes that Neil has explored previously, Greendale makes the challenges of modern day life in a small rural town an experience which many can relate to in their everyday lives. One of the more bizarre connections of Greendale is that of an episode which occurred shortly after September 11, 2001 involving a letter containing anthrax which was sent to Senate Majority Leader Tom Daschle. From the FBI : "From the outside, the Leahy letter appears virtually identical to a letter received in the office of Senate Majority Leader Tom Daschle on October 15. The October 9, 2001, Trenton, N.J., postmark, the 'Greendale School' return address, block handwriting and other characteristics have combined to convince investigators that the letter was sent by the same person." The 2003 North American Greendale tour came to an end in Irvine, CA on September 20, 2003. According to Numbers on the Site , a total of 43 shows were performed containing 33 different songs, including the core 10 Greendale songs. The longest show contained 20 songs on July 29, 2003, at Red Rocks Amphitheater, Denver, CO, clocking in over 3 hours. The Boston Globe on 9/19 pronounced the Greendale tour as "easily one of the top 10 shows of the year". The Greendale tour was extended into China (Neil's first performance), Japan and Australia. The romanticism of some of Neil's most loved earlier work has been left behind in order to explore much more serious themes in Greendale such as the power of mass media and global corporations, loss of personal freedoms and privacy , destruction of the environment, and an out of balance government. Greendale's message that "you can make a difference if you really try" has resonated around the world and struck a chord with audiences being challenged to think, act and become involved. 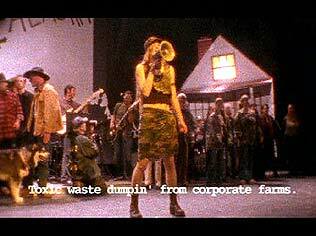 While Greendale will not be the highest selling or most critically acclaimed album of 2003, it is -- without a doubt -- the most important album of 2003, the musical equivalent of Silent Spring. Well, it looks like those critics over at Rolling Stone magazine have actually taken some time to listen to Greendale and absorb the significance of the most important album of 2003. Thankfully, it looks like I was wrong when I wrote in August that "Greendale will not be the highest selling or most critically acclaimed album of 2003, but it is without a doubt the most important album of 2003." "Despite the hype surrounding the two of the biggest "The" bands since the Beatles and the Stones, the Strokes and the White Stripes pulled in fewer votes for their respective 2003 releases (four) than did the latest offerings from grunge godfather Neil Young and long under-appreciated power-pop outfit Fountains of Wayne (both with five). 8. Full of ambition and conviction, the raw and powerful Greendale is the anti-pop album. More Rolling Stone critics comments on Greendale and the best albums of 2003 on news page. "The inconvenient truth of Neil Young's Greendale is that it's message is even more relevant today than upon its original release." "a new movie genre--of Neil's invention--the independent film music video. Shot in glorious Rustavision, of course. I love that blurry particularized home-movie effect." Which Greendale "style" do you prefer? Unplugged, plugged, or studio? In the previous poll, we asked "How will Neil Young's Greendale rate in 10 years?" A classic like Rust Never Sleeps? Or a throw-away/Geffen-like release? Last we checked, an overwhelming majority thought Greendale would become a classic. To check the latest results, go to Poll page. Read more of the commentary and criticism and controversy about the Greendale album and concert by Neil Young. "IGNORE THE OLD. EMBRACE NEIL YOUNG. Lesser men wither, but Neil Young just gets stronger, making music that’s profoundly important and even better - exceptionally cool. His latest is Greendale, a rock album that flows like a novel and feels like a classic. It sounds like Young but reads like crazy: 10 songs about a fake town in Neil Young's head. The companion DVD, a live show in Dublin, brings the whole story to life. " This is a time, I believe, of great inner turmoil for the majority of the American people. There is a new morality coming out of this administration -- fundamentalist religious views; a holier-than-thou attitude towards the rest of the world -- that is not classically American. I don't think Americans felt holier-than-thou in the twentieth century. We were happy and successful, with a great lifestyle. But something else is going on now. That's what Greendale is about. That's what Grandpa's problem is. He can't understand what's going on. He sees all of these things that the Patriot Act has taken away from what he feels is America. More interviewson Greendale with Neil Young. There comes a time when artists of a certain stature decide that their muse can no longer be restrained by the confines of a mere rock song and must spread its wings across an extended narrative. This is a delusion that cannot be dealt with firmly enough. Since the Who birthed the idea on 1969's sprawling Tommy, it has spawned numerous incomprehensible mish-mashes of half-baked science fiction, heavy-handed metaphors and Rizla philosophy. "I don't know what to say about it," says McDonough after he caught the tour on the West Coast. "Any self-respecting Neil Young fan should definitely see this one, because never has his chaotic, unique psyche been laid out in such utterly jaw-dropping detail. "He's touring with, like, 50 people - dancers, family members - and they act out the songs behind Crazy Horse, playing them, and mime the words in a style you haven't seen since the silent era. I gotta tell you man . . . wow. He's definitely done something original again. "You gotta admire the cojones on the guy. He goes out in front of a huge audience and plays 'em an entire album they ain't heard, with a bunch of non-actors emoting it out, and cardboard sets. It's just really Neil, for better or for worse. "He's definitely following his muse . . . right off a cliff. It just blew the back of my head off. I don't know where he goes from here."